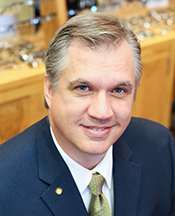 Kevin Harte, O.D., is a graduate of Northern Illinois University’s Bachelor of Science program. He then went on to earn his Bachelors of Science in Visual Science and a Doctorate of Optometry from Illinois College of Optometry in 2001. His clinical training included rotations with the Tomah VA Medical Center, Tomah, WI; Wolfe Eye Clinic, Cedar Rapids, IA; and the University of Chicago Duchossois Center for Advanced Medicine (DCAM) Bergman Eye Center, Chicago, IL. Dr. Harte is a lifelong resident of the western suburbs and enjoys spending time with his family and outdoor activities. He welcomes all new patients. 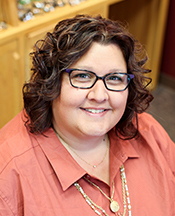 Rebecca is a licensed optician and has been providing quality eyecare in the community since 1998. To remain current in the optical field, Rebecca has continued with her education since receiving her license. In order to give back to the community, Rebecca previously served as the market team leader for the One Sight Chicago clinic, which in one year has seen as many as 10,000 children. Rebecca and her husband, Ron, live in Sycamore with their twins, Bradford and Shelby. Rebecca also supports her local special olympics group that her daughter is active in. Chris graduated from Army Optical Training in 1989. During the first Gulf War, he worked on nearly 120,000 prescriptions in a single month. He and his wife, Lisa, (also an optician) met while in the military and they both served overseas making eyewear for military personnel in Europe. 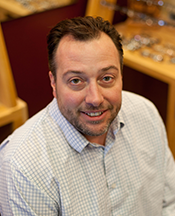 When Chris left the military, he continued working in the optical field at the retail level. 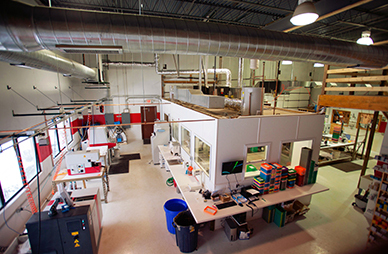 In 2006, he started an independent wholesale optical lab producing eyewear for offices in the southern Wisconsin, north central Illinois, southern Missouri area. Lisa was born and raised in Pennsylvania before joining the Army is 1987. While in the service, she attended the Optical Laboratory Specialist School in Colorado, where she met her husband, Chris. In 1995, after the Gulf War and a three-year tour in Europe, Chris and Lisa worked in the community and decided DeKalb County was a good place to raise their family and to open Advance Family Eyecare Center. 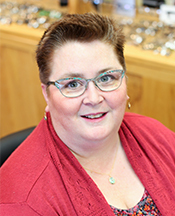 Lisa enjoys meeting new people and helping them with their optical needs. 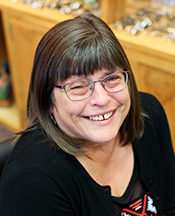 With over 20 years of experience in the optical field, and seeing the dramatic difference the right eyewear can make, Lisa and Chris still takes pride in providing high quality affordable eyewear for all. They reside in Sycamore with their two sons, Jacob, a Sycamore high school student, and Michael who graduated Sycamore high school and is now attending Michigan School of Aviation.